The French have a very specific and slightly poetic phrase for objects that are both unappealing and chic: jolie laide, which translates to “pretty ugly.” The principle behind the theory is that it’s the mix of contrasts that makes it (and life) interesting, and nothing says that more than a pair of $850 Gucci loafers covered in an insane amount of kangaroo fur. During the last few years, footwear that one might consider clunky, ungainly, or downright ugly started trending hard on the runway, arguably spurred by Phoebe Philo of Céline who turned babouche flats, giant platform loafers, and mink-lined Birkenstock styles into status symbols. Most recently, cult-favorite retailer and designer Maryam Nassir Zadeh’s glove heels propelled the “chic-ugly” shoe forward, as evidenced by the numbers of knockoffs we’ve seen this season alone. Designers creating shoes that aren’t objects of beauty—at least not in the traditional sense—is nothing new, however. Who could forget Alexander McQueen’s Spring 2010 collection, which highlighted the infamously unwalkable armadillo shoe that was hailed as being a mix of completely impractical, covetable, totally spectacular and groundbreakingly hideous. 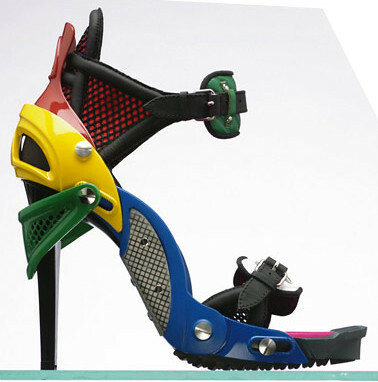 And before that, a shoe that was loved just as much as it was hated debuted during Balenciaga’s Fall 2007 show, which some fondly refer to as the “Lego heel.” Yet in the case of both styles—despite being tragically tall and seemingly uncomfortable—fast-fashion labels such as Steve Madden and Jeffrey Campbell swiftly knocked them off for the masses (and were subsequently hit with giant lawsuits). In the years that followed, a succession of high-end footwear emerged that made you say “wow” (or “ew,” depending on who you ask) that also got increasingly more comfortable: Giant wedge sneakers and flatforms were followed by pool slides, slip-on sneaks, and designer updates to shoes like Birkenstocks and Tevas. Right now, the aforementioned granny heel—a sturdy two-inch block—is fashion’s shoe of choice coupled with Gucci’s fur-lined flats, which pretty much ruled the street-style scene during the last year. Above, a brief history of some of our favorite ugly-chic shoes on the runway.